Chicago defeated Indy on a buzzer-beating shot off a stolen pass (that was stolen by Indy just a second before) by John Little to win the Indy Invitational in OT, 45-43. That game was a very exciting, hard-fought one and had the club debut of Chicago’s Layton Seeber, the recent Gallaudet/Deaflympics point guard, who was a pleasure to watch. Indy has the last shot go in in regulation but that was waved off due to a called foul just before the shot. The next shot by Cara Vasquez, a 3-pointer, went in and out of the rim to provide an OT ending. The win by Chicago was instrumental in handing Indy their first home court loss to a regional team in over a decade. The tournament was vibrant and enjoyable despite the heavy snow. Four Chicago teams (CCD, Rebels (coached by Mike Ashford), Beasts and Rumble) and Kentucky participated along with two Indy teams. The Chicago Rebels defeated the Indy “B” for 3rd place. The Hawks will have their annual tournament this coming Saturday at the Indiana School for the Deaf’s Caskey Gym with seven teams participating. Past champions have included the Hawks, DC East Zone and participating teams Riverside (Deaf Sports Academy), NJ Warriors and Kansas City. This year’s edition will be more a regional affair with localized teams participating. Several former Gallaudet University, Deaflympic and recent high school graduate players figure to be on display this Saturday. Based on 2013 CBAD results in ( ), here is the seeding for this Saturday. WSAD Mustangs (3) and Detroit Panthers (5), and CCD Stags/Shockers (7) are unable to come this Sat. Game times are at EST. Attendance is $5 per adults with lower prices for students/children. Concession stand will be open. Brian A. Bippus ’93, was presented by his former men’s basketball coach James DeStefano, who discussed his recruitment of Bippus and then went into year-by-year career highlights of his time as a Bison player. 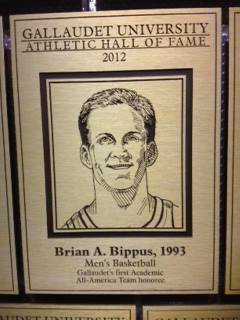 Bippus graduated as the all-time leading scorer for men’s basketball in Gallaudet history with 1,882 points. He played four years (1987-91) for the buff and blue as the Bison began their 20-year membership in the Capital Athletic Conference. Bippus became the first Bison to earn All-CAC honors as he was picked for the first team during the 1990-91 season. The three-time team captain also excelled in the classroom and became Gallaudet’s first-ever Academic All-American when he was named to the 1990-91 second team. He also earned All-District II first team honors. The high-scoring and hard-defending Dynamic Duo of Robert Haney and Sekoe White have committed to play for the Indy Hawks for the 2013-14 basketball season. Both recently led the New Mexico Zia to the 2013 USADB Championship and the 2013 Deaflympics USA Men’s Team to the Bronze medal in Bulgaria. Haney now enters his third stint with the Hawks, having played with them in 2001-02 and 2007-2010. In his latter years, he led them to three consecutive USADB championship games, capturing the first two. From 2007 to 2009, he was named the USADB’s Most Valuable Player given his dominating performances those seasons beginning with the DC East Zone, whom he led to the 2007 USADB championship before beginning his run with the Hawks. White, the reigning USADB Most Valuable Player, will be the team’s Restricted Free Agent (RFA) while he continues his duties at the Mississippi School for the Deaf where he doubles as the Boys Basketball coach for the Bulldogs. 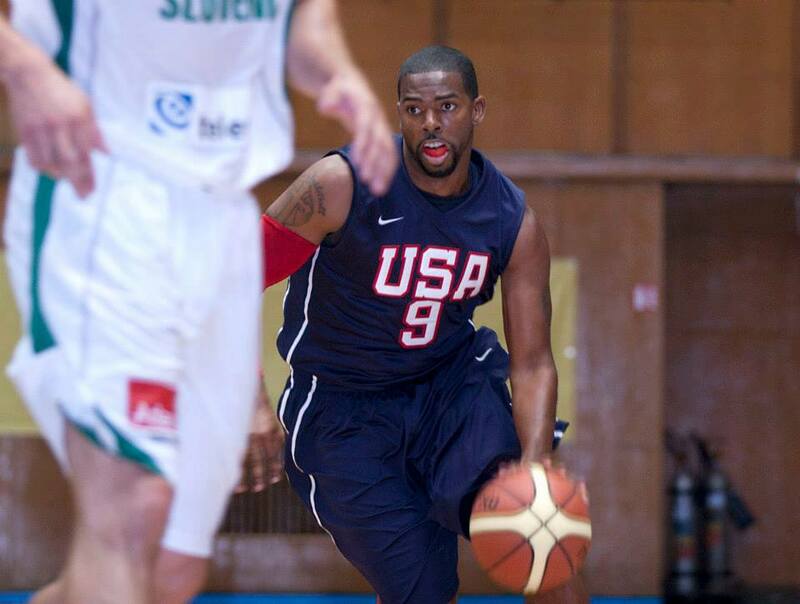 White, after an illustrious career at Gallaudet University, led the North Virginia (NVCD) to the USADB Championship in 2010 before playing for the New Mexico team. 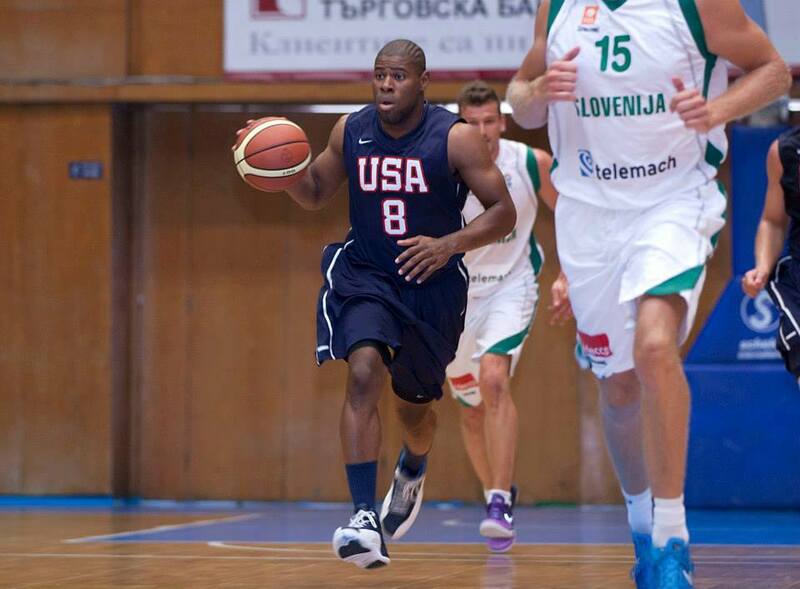 This recent summer, he led the USA team in scoring. Both combo guards have veteran savviness and leadership that will help the Hawks look to rebound from last season’s 4th place finish at the Philadelphia Nationals. Veterans Brian Bippus, Edlin Dorn and Keith Westhoelter along with Kyle Bingham, the 6’1 guard who made a huge splash last season in his rookie year, are expected to return. You are currently browsing the The Indy Hawks blog archives for December, 2013.